Under the [Greek] Olive Tree: Greek Children's Fund Sport Auction at Central on Friday, May 9th! 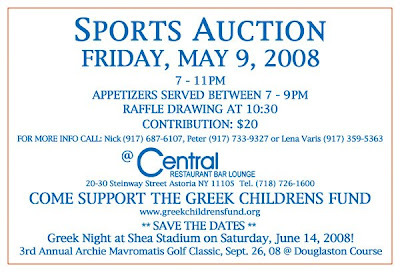 Greek Children's Fund Sport Auction at Central on Friday, May 9th! Hope you can make it out to this great sports event! Even better than the memorabilia? The great cause the proceeds support!